The Woman Within catalog is a free women's clothing catalog / plus size clothing catalog that sells clothing for women who are sizes 12W-44W. Not only does the Woman Within catalog have affordable prices, but they also have a great selection of tops, bottoms, coats and jackets, lingerie, swimwear, sleepwear, dresses, and shoes. The clothes are comfortable but still stylish so you feel your very best whether it be lounging at home or going out for a stylish party. If you'd like to have a Woman Within catalog mailed to you for free, you'll need to first visit the Email & Catalog Preference Center page on the Woman Within website. On that page is a form that you must fill out with your first and last name and the full mailing address for wherever you want the Woman Within catalog to be shipped. When you're finished, just hit the Submit button to request the clothing catalog. You will receive your free Woman Within catalog in the next 2-4 weeks. Tip: To change how often you get the Woman Within catalog, or to unsubscribe to the catalog completely, visit the same page above but choose the "receive less catalogs" or stop receiving catalogs" choices to make those changes. If you decide to order from the catalog, you can simply enter the item number into the quick order form and then search for the item you're interested in. You can also use their categories or search box to find what you're looking for. The Woman Within catalog is only mailed to those who have a United States, AA/AE/AP, or US territory address. If you are out of that area you can still shop from the Woman Within website. 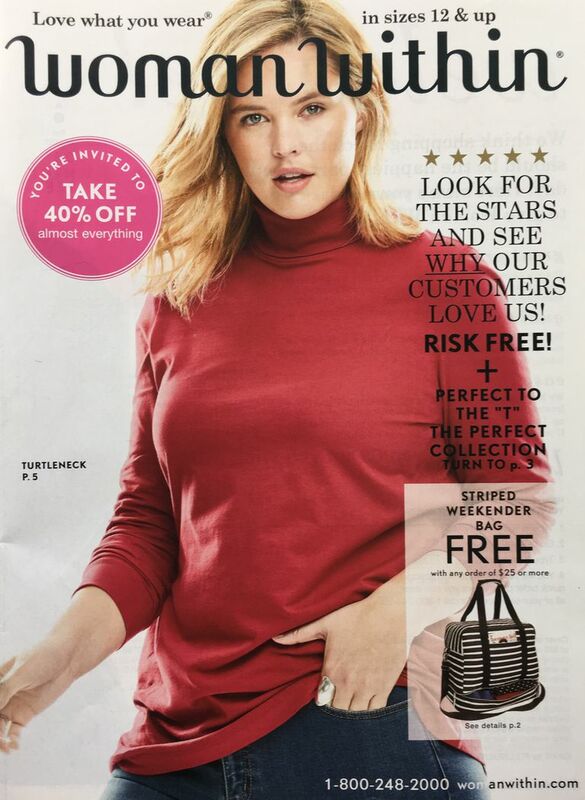 If you like the Woman Within catalog, you'll also like these other free clothing catalogs you can request from Lands' End, L.L. Bean, Garnet Hill, Chadwicks, and Chico's. Instead of shopping through the Woman Within catalog, you can just go to their website at WomanWithin to add items to your shopping cart and checkout online. Use the menus at the top of the Woman Within website to find items categorized in sections like tops, bottoms, dresses, outerwear, active, swim, sleep, lingerie, and shoes & accessories. Within these menus are other menus that help you find more specific things like tank tops, jeans, coats, skirts, robes, sandals, etc. There's also a New menu where you can find the newest arrivals in all the categories or just the newly added tops, shoes, swim, or accessories. Also in this menu is where you'll find recently reduced items, things that are 50% off or more, and other deals. In addition to these menus is Clearance so you can find additional items that are at a large discount. Check out the WOffers to find the latest coupons and discounts that you can use on this order or orders in the future. 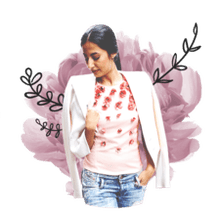 One great thing about shopping at Woman Within through their website versus the catalog is that you can narrow down the results to better fit what you're looking for. For instance, when looking through the clearance markdowns, you can filter the results not only by category like swim or petite, but also by specific size, color, brand, and price range.